When I got home on Monday evening from my trip, there was a HUGE almost whole watermelon left in my fridge that needed to be eaten. I ended up cutting it up into cubes and it filled three huge tupperware containers, so I knew I needed to come up with a way to use it fast. 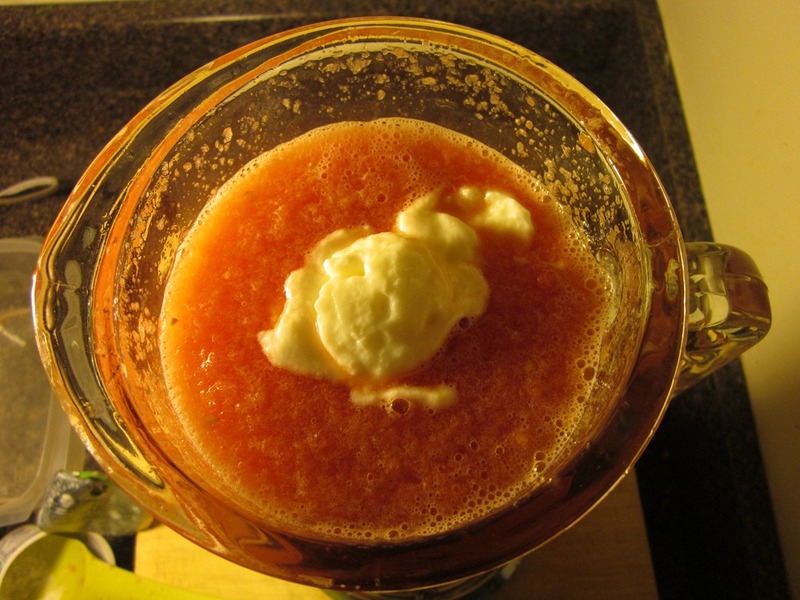 I wanted a recipe that would not only be delicious, but would use a good amount of the watermelon and would be super refreshing in the intense heat this week has brought. This recipe is so simple that it’s hard to even call it a recipe because it requires nothing but turning on the blender! 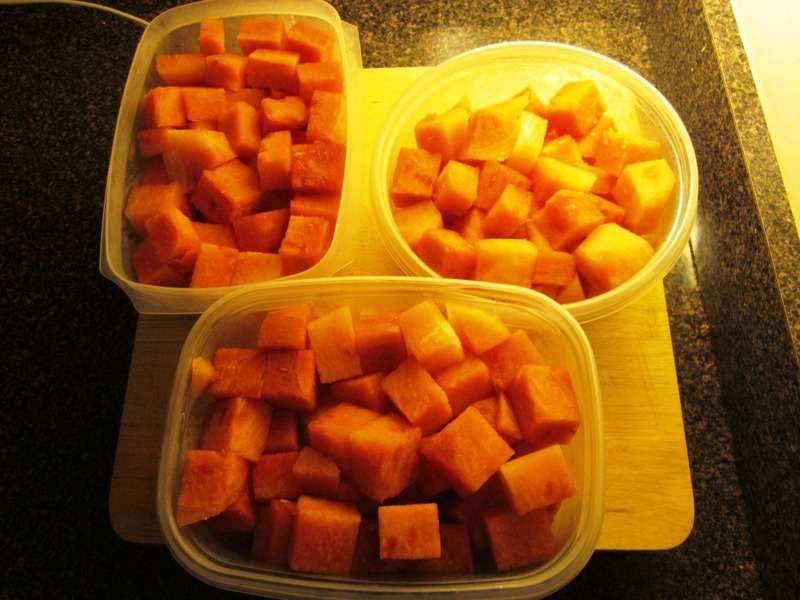 Start by putting about 2 cups (half) of the watermelon and any juice from the bottom of the container into the blender. 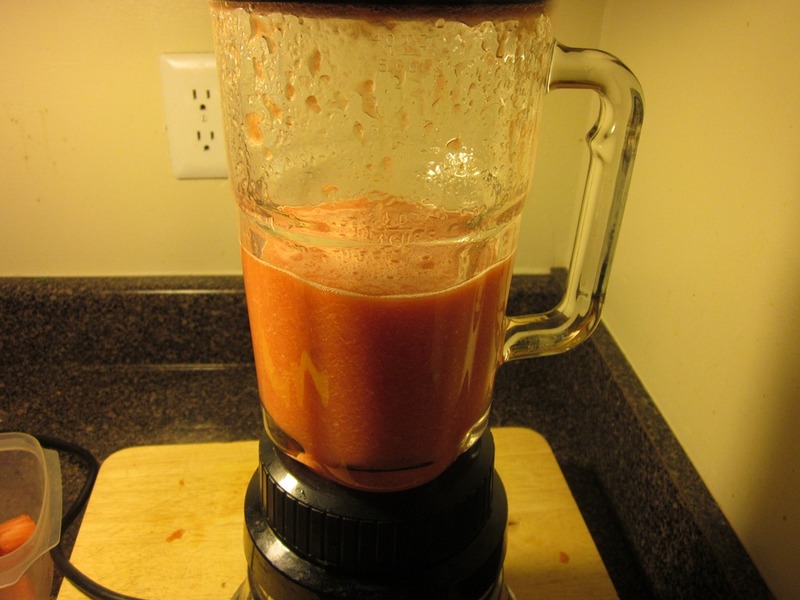 Blend until the watermelon is smoothed out and blended to a uniform consistency. 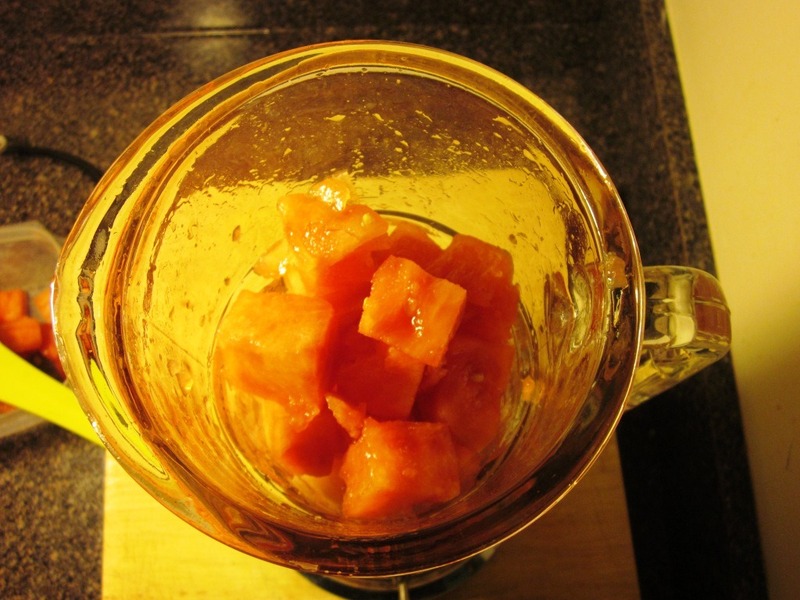 Now add the rest of your watermelon and blend again until combined. 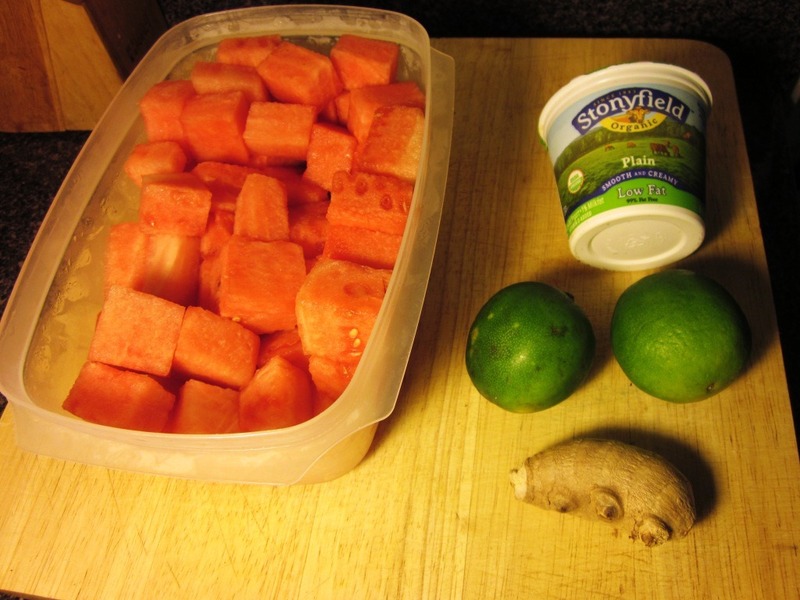 Next, add in the rest of your ingredients – lime juice, ginger, yogurt, and honey if the watermelon isn’t that sweet (I didn’t end up using the honey). Blend again until combined, and chill for 1 hour. Garnish with basil, mint, or extra yogurt if desired. This soup is SO delicious, but is probably best eaten right away. I realized the watermelon might separate, so I came up with the perfect way to use the rest of the soup – popsicles! I found this little popsicle mold at Target for $1. Can’t beat that. Freeze for 3-4 hours until frozen through, and that’s it! These are delicious! The ginger adds a subtle spice which is perfect against the sweet watermelon, the tang of the lime, and the chill of the soup/popsicle. The flavors work so well, and it literally takes about 5 minutes to throw this together. Delicious food + 5 minutes of my time = Happy Beth. What is your favorite fruit in the summer time? Mine is a tie between watermelon and juicy peaches! That’s looks great! I’ll have to try that. I’m all about berries during the summer–any kind, really, but especially blueberries. Love the idea of the soup and the popsicles. I’ve been eating fresh fruit like crazy — mostly strawberries that are tasting really good right now! How creative. I love watermelon.. and think that soup would be an excellent way to cool off on a hot summer day! i used to have one of those popsicle makers when i was little!!!! i loved it. need to get another one! I loooove watermelon!!! I am not sure if I would like it as a soup, but those popsicles… must.make.now! Sounds delicious Beth! 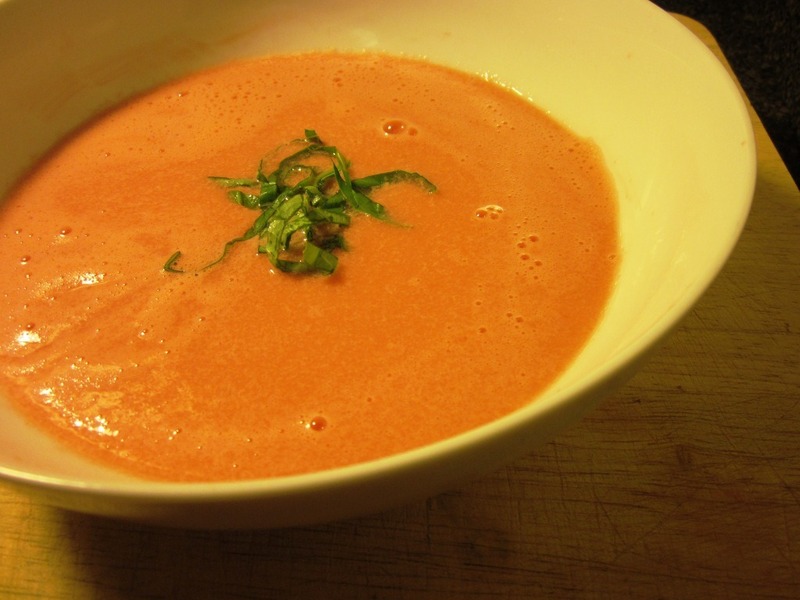 I never thought about making watermelon soup before. It seems easy enough for me to try it. Love your recipes! That watermelon soup looks so refreshing and delicious! The popsicle mold at Target for $1 was such a steal too. Definitely will have to check that out and get myself one!! That looks yummy! 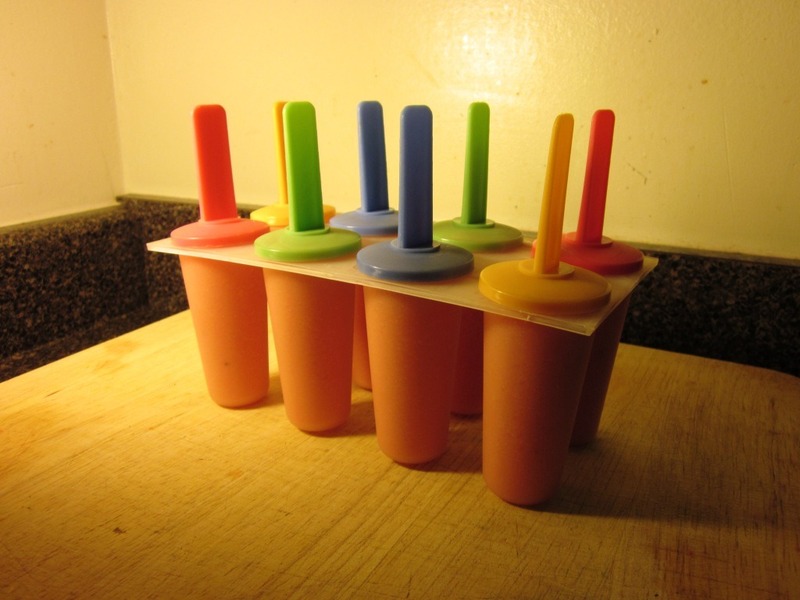 I love the idea of making popsicles – will look for the molds today! I love the popsicles! What a great idea for summer! I love berries but particularly blueberries and strawberries right now. I wanted to tell you too…you motivated me to finally make it to a farmers market yesterday and I got some great stuff! Thanks for the heads up about how great they can be! I’m with you, watermelon and white peaches! Fruit is just so yummy! Wow that’s so creative! I love it! I LOVE watermelon in the Summertime. Great idea for a dessert! Looks delicious! I had something similar to that a few years ago on a cruise, but I bet this is much healthier! I love your post Beth!!! Thanks so much for all the motivation (especially over the last few days) and this stellar recipe. 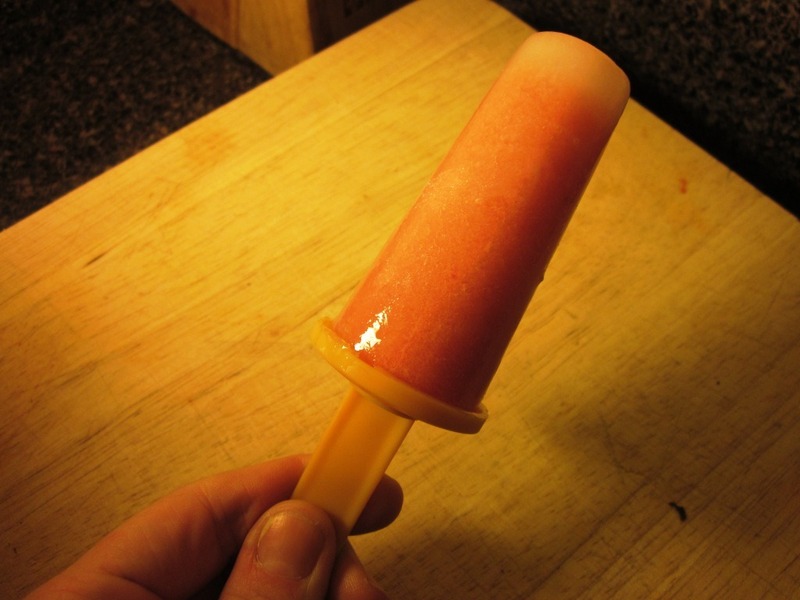 I JUST bought a popcicle mold myself….and will be giving this a try! Have a great day. I’ve been so in love with cheap strawberries right now! Omigosh what a great idea – especially the popsicle trick. Delicious! I need to get one of those popsicle things and try it as I LOVE watermelon! Yay! You used the idea I suggested! I’m glad they turned out well. I have been meaning to do this for a while now. Maybe I will get to it tonight. I have A watermelon in the fridge that I need to do something with. My favorite summer fruits are cherries and cantaloupe-yum!!! definitely think watermelon is #1 the alltime best summer fruit.. but mangoes are yummy too! The watermelon soup sounds delish! I’m definitely going to give it a try. I love, love, LOVE fresh pineapple!! It’s my fav for sure! I could eat an entire one and often get grumpy when my husband tries to eat some! Ha! 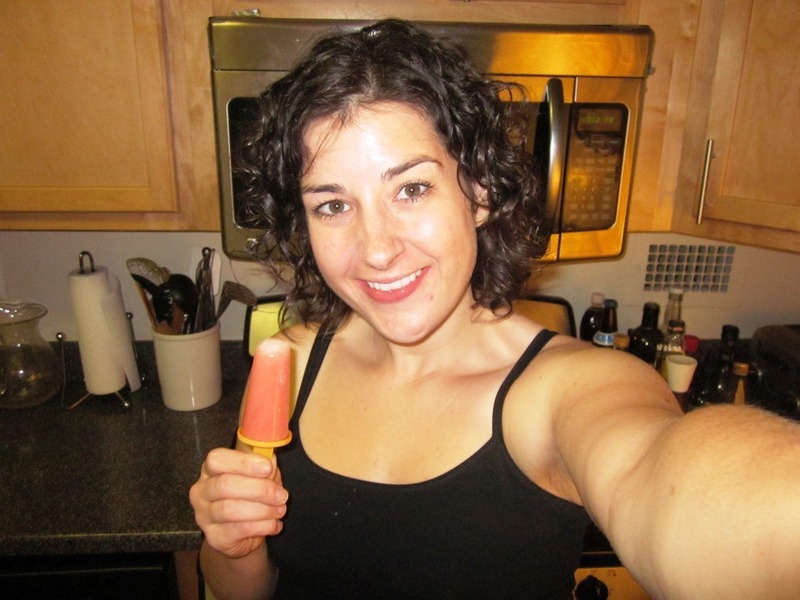 I love the idea of watermelon soup and popsicles! I’m not a fan of watermelon myself (actually, I don’t like any of the melons) but my husband is and my daughter might be too (she’s only 8 months old, so I haven’t given it to her yet). Thanks for the great ideas! !